Hipiwe Incense Holder Burner with Ash Catcher (Stick/Cone/Coil Incense),Censer Stick Plate Holder Incense Burner Sandalwood Furnace with Incense Burner Holder(Red Bronze) by Hipiwe at Home Decor Outlet Store. MPN: HPWSN00026. Hurry! Limited time offer. Offer valid only while supplies last. EXQUISITE DESIGN - The incense burner come with a Calabash Incense Holder, which suitable for Corn Incense, Incense Stick, Coil Incense; It is easy to clean; can be washed with water or directly wipe it with plaster. 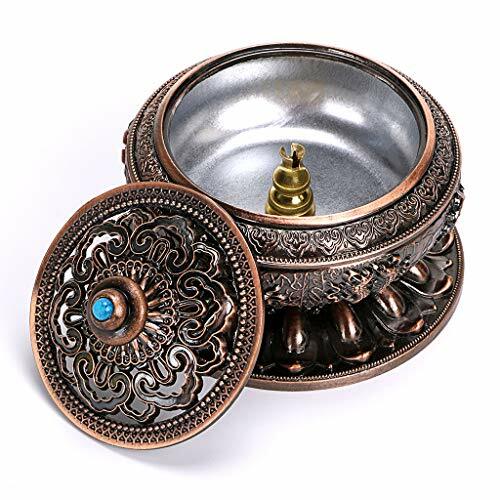 GORGEOUS AND WELL MADE:The Incense burner uses Eight Auspicious Symbols of Buddhism with eight different patterns which means good luck and everything goes well; Quaint embossing pattern,hollow out design Cover,every details is delicate and beatiful. MULTI FUNCTIONS - Incense holder burner could be a great choose for religion or meditation purpose or be used as a bowl to burn rosin and incense powder.It's a a great decorative art piece be applied to living room, bedroom, meditation room, yoga room, bathroom.It also can be a tea accessory, ornament, collection, props or a great gift to your friends or family make them fondle admiringly . SIZE - 3.82" X 3.15"/9.7cm X 8cm (DiameterxHeight): and no ashes of normal incenses will be fall over outside the incense burner.